Cheap Mineral Makeup: The most bang for your budget. Discover the best cheap mineral makeup brands! Mineral foundation makeup and organic mineral makeup aren't always expensive, and a few select companies provide the best products for lowest cost. I know it sounds hard but it is possible to find mineral makeup for under ten dollars! Mineral makeup has become one of the fastest growing product lines in the entire beauty industry over the past couple of decades. Bare Escentuals started it all with their perfume-free, chemical-free and paraben-free mineral makeup, taking the woman's world by storm and turning it upside down. True and honest mineral makeup can do a lot for your skin, especially if you have acne or rosacea. However, many new brands are claiming to offer natural mineral makeup, but in reality are often still adding fillers, chemicals, dyes, and perfumes to the ingredient list. This is common with cheaper mineral makeups as companies seek to lower costs. However, many affordable mineral makeups can be bought in stores or online that still retain some natural qualities. The affordable mineral makeup company is a good one, keeping their makeup as natural as possible. Their claim to fame is pricing plus the lack of harmful ingredients that many other companies add. AMM makeups don't contain bismuth oxychloride, parabens, chemicals, talc, fillers, petroleum, dyes, or nanoparticles, which can be dangerous to the skin. They also have a no animal testing promise. 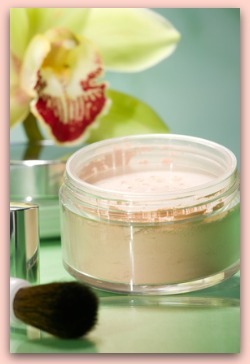 5 gram jars of foundation, blush, and mineral veil cost $6.79, a great price for high quality, chemical-free makeup. One benefit to buying from AMM is that you can buy as small an amount as a sample baggie, or order an extra large container all at once. They only have four ingredients, just like the more expensive Bare Minerals. Mineral Pure Makeup is another good company that stands behind the original intention of mineral makeup: to be free of chemicals, parabens, dyes, and fragrances. MPM even has a section of their website dedicated to listing all of the ingredients in each of their products. (We like this!) 5 grams of foundation costs $8.50, slightly higher than Affordable Mineral Makeup, but still quite inexpensive. 3 grams of blush will run you $5.95 per jar, and you can get a real goat hair Kabuki brush for $12.50. This is certainly a company worth trying out if you're looking for quality, cheap mineral makeup. E.L.F stands for Eyes Lips Face, a young and growing company that offers some of the cheapest makeup you will find anywhere. Their original signature line contains dozens of items priced at just one dollar, and no, that isn't a sale price. Their studio and mineral lines are a little more expensive, but at just $3 to $8 per item, this is a one stop shop you won't want to miss! The downside to the great pricing is that E.L.F's mineral makeup is not completely pure, and contains bismuth oxychloride that may irritate some women's skin. We definitely prefer E.L.F's original line and studio line because of their higher quality, but the minerals are worth a try if you want to save money. E.L.F mineral blush is our favorite mineral product; it blends well and has a natural, pretty color to it. The concealer received a thumbs down for not having very thorough coverage. To some extent you do get what you pay for with cheap mineral makeup, so be sure to read all of the labels and look for hidden ingredients before buying a new brand.